Citation: Hemalatha S, Makeswari M. Photocatalytic Degradation of Vat Red 13 by Green Synthesized Copper Oxide Nanocatalyst. Int J Chem Sci. 2018;16(2):260. Copper oxide nanocatalyst was synthesized by green chemistry approach using Eichhornia crassipes leaf extract. The photocatalytic activities of copper oxide nanocatalyst was evaluated using the photocatalytic degradation of Vat Red 13 under the irradiation of UV light. The maximum photocatalytic activity of the copper oxide photocatalyst was observed at 60 min of irradiation for a catalyst dose of 4 mg at pH 6.6. 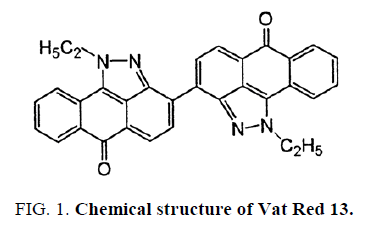 The degradation of Vat Red 13 was confirmed by comparison of UV and FT-IR studies of the dye solution and copper oxide nanocatalyst treated dye solution. Water pollution is one of the major problem worldwide and most important causes of deaths and diseases. The textile industry has been condemned to be the world’s vilest water polluters. The waste water from textile industry is extremely charged with unconsumed dyes and traces of metals. These discharges cause a major destruction to the environment. So everywhere researchers are looking for proper managements in order to get rid of these pollutants and to achieve degradation of dye house effluents [1-3]. The presence of even very little concentrations of dyes in effluent is very much visible and disagreeable . There are over one lakh commercially accessible dyes with over 7 × 105 ton of dye-stuffs produced annually . Since dyes have complex structure it is difficult to decolourise or degrade the dyes. There are different varieties of dyes such as, basic, acidic, vat, disperse, diazo, azo, anthroquinone based and metal complex dyes. In specific, the liberation of dye-containing emissions into the water location is disagreeable, not only because of their tint, but also for the reason that many of dyes released and their breakdown products are noxious to life forms mainly because of carcinogens, such as naphthalene, benzidine and other aromatic compounds . Without ample management these dyes can persist in the location for a prolonged time. For instance, the half-life of hydrolyzed Reactive Blue 19 at pH 7 and at a temperature 25°C is found to be 46 years . To lessen the perilous effects of dye waste water, many methods such as microbial degradation, coagulation, incineration, adsorption on activated carbon, bio-sorption, sedimentation and filtration etc., have been devoted [8-10]. On the other hand, these procedures are non-destructive because they simply transport the non-biodegradable substance into slush and provide a new-fangled type of contamination, which requests additional treatment [11-13]. As a result, the hunt for effectual means of removing these compounds has induced many researchers to tackle the ever-growing challenges in renewable clean energy and environment where the activity of catalysts can be maintained or improved and thereby the chance of secondary pollution may be restricted. Mainly, semiconducting metal oxides which act as activators in photocatalysis are capable of extending their efficacy without significant loss in activity. The wide spread use of semiconductor metal oxides increases the opportunity due to their exceptional properties such as superconductivity, high temperature stability, ferromagnetism, ferroelectricity, semi conductivity, piezoelectricity and catalytic activity . Remarkable examples such as SnO2, TiO2, ZnO, SrTiO3, ZrO2, CdS, Fe2O3, MOS2, WO3 and WS2 have been accepted as active photocatalysts for the degradation of a number of organic contaminants, synthetic dyes etc. Currently photocatalytic degradation is one of the most vital scenarios in pollution control [15-18]. The challenge of photocatalytic degradation is to produce an efficient semiconductor catalyst. In particular, copper oxide (CuO), a chief p-type transition metal oxide semiconductor having a narrow band gap (Eg=1.2 eV) and an exceptional band structure has received a good deal of attention due to its diverse applications in different fields of solar energy cells [19,20], gas sensing [21,22], electronics [23-25], bio-sensing , heterogeneous organic catalysis, super conductors and so on. In the present work photocatalytic degradation of a vat dye (Vat Red 13) was carried out by a green synthesized copper oxide nanocatalyst by varying parameters like catalyst dose, dye concentration, pH and irradiation time. The degradation was confirmed by UV-Visible and FTIR spectral studies. The chemicals used were of analytical reagent grade and used as received without further purification. Copper sulphate and NaOH were purchased from Merck, India. Vat Red 13 dye (Molecular Formula: C32H22N4O2, Molecular Weight: 494.54 g) was purchased from Chemical company in India, and distilled water was used all over the entire experiment. The chemical structure of Vat Red 13 is given in FIG. 1. Figure 1: Chemical structure of Vat Red 13. Copper oxide nanocatalyst was synthesized from Eichhornia crassipes leaf extract and Copper sulphate using NaOH and characterized by UV Visible absorption spectra, XRD, EDX, FTIR and SEM analysis as reported in our previous work. The synthesized Copper oxide nanocatalyst was used in the current work. The photocatalytic degradation studies have been carried out in a laminar air flow system. A low-pressure mercury vapour lamp has been used as source of UV irradiation. The lamp emits 8 W of UV radiation with a peak wavelength of 254 nm. The experimental procedure constitutes of irradiation of dye solution of different concentration (10 ppm to 50 ppm) mixed with different quantity of catalyst powder (1 mg to 5 mg) at a constant volume of 100 ml. Adsorption equilibrium between the dye molecules and the catalyst surface was established by stirring the mixture for about 20 min in dark. An UV light source of 8 W was used to irradiate the solution. 3 mL samples have been withdrawn at a time interval of 10 min. It was then centrifuged, and absorbance measured at 540 nm and returned to the reactor. The studies were carried out at a temperature of 30°C. Where Ci is the initial dye concentration and Cf is the final concentration of dye after photoirradiation. The photodegradability of dye has been found out by exposing the dye solution to UV light with and without copper oxide nano-catalyst. A sequence of experiments was performed to study the influences of nanocatalyst dose, dye concentration, irradiation time, and pH on the photocatalytic degradation under irradiation of UV light. The dye degradation was confirmed by UV-Visible and FTIR studies of the dye solution, control solution and copper oxide nanocatalyst treated dye solution. 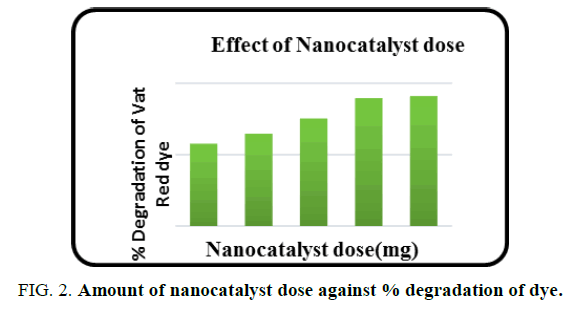 The effect of nanocatalyst dose on the dye degradation was found by subjecting dye solution to UV irradiation with different dose of catalyst varying from 1 mg to 5 mg. A plot of degradation percentage of dye vs. catalytic dose is shown in FIG. 2. The degradation percentage increases as the catalytic dose increases because of increase in availability of active sites. At 4 mg catalytic dose, about 90% of the dye was found to have degraded. Hence 4 mg of catalytic dose was fixed as optimum dose and was used for further studies. Figure 2: Amount of nanocatalyst dose against % degradation of dye. The effect of concentration of dye on the photodegradation of Vat Red 13 was carried out at different dye concentrations ranging from 10 ppm to 50 ppm. FIG. 3. shows the degradation percentage at various dye concentrations. It was observed that the degradation percentage slowly decreased with increase in dye concentration. The optimum concentration of the dye was found to be 20 ppm and fixed for further studies. Figure 3: Amount of nanocatalyst dose against % degradation of dye. Irradiation time was evaluated as one of the most important factors affecting degradation efficiency. Absorbance measured at 10 min interval of time and % degradation calculated. 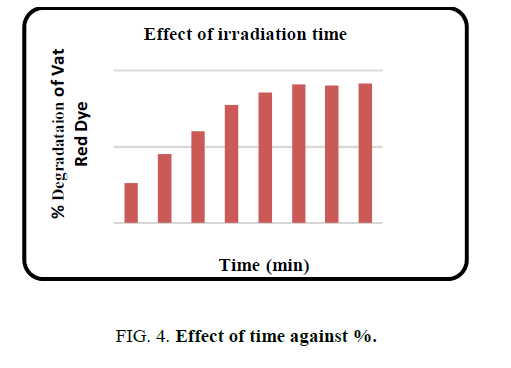 A plot of irradiation time against dye degradation is given in FIG. 4. It was seen that 90% degradation occurred at 60 min and after that no predominant change. Hence an optimum time of 60 min was selected for further studies. Figure 4: Amount of nanocatalyst dose against % degradation of dye. One of the important factors that affect the photocatalytic degradation was the pH of the solution. Hence experiments were performed to know the effect of pH on the degradation efficiency of Vat Red 13 which is shown in FIG. 5. The experiment was performed by varying the pH of the dye solution using HCl or NaOH solution. 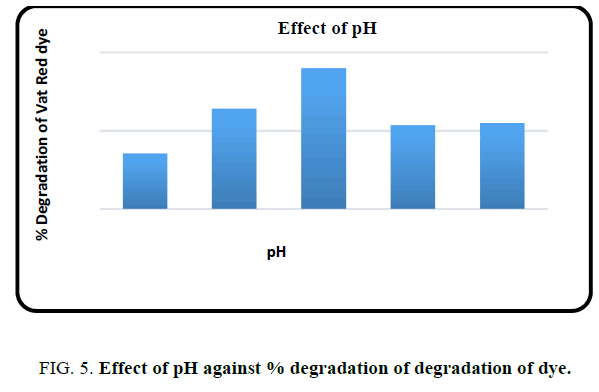 The degradation percentage was maximum at pH 6.6 which is the pH used for further studies. Figure 5: Amount of nanocatalyst dose against % degradation of dye. UV-Visible and FT IR spectral studies were carried out for the confirmation of dye degradation. The spectral analysis was performed for (i) the dye solution and (ii) dye solution of 20 ppm at pH 6.6 irradiated for 60 min without copper oxide nanocatalyst and with copper oxide nanocatalyst of 4 mg. FIG. 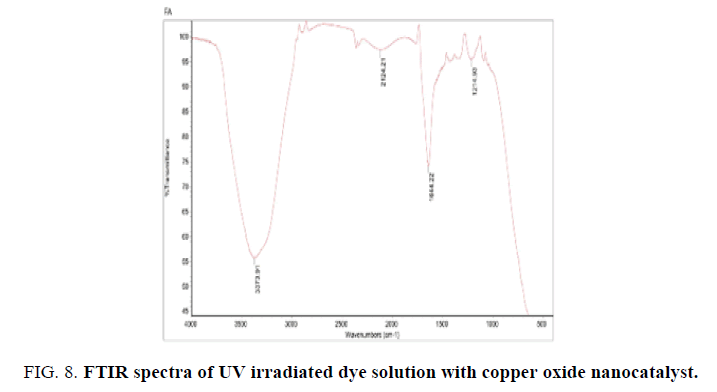 6 gives the UV-Visible spectra of the dye solution (A), UV irradiated dye solution without copper oxide nanocatalyst (B), UV irradiated dye solution with copper oxide nanocatalyst (C). No change in the spectra was observed for the dye solution irradiated without copper oxide nanocatalyst. But for the dye solution irradiated with copper oxide nanocatalyst, as the degradation reaction preceded, the main characteristic absorption peak at 540 nm for Vat Red 13 dye disappears, which shows the degradation of the dye. Figure 6: Amount of nanocatalyst dose against % degradation of dye. The transfiguration of the Vat Red 13 dye molecular structures by photocatalytic degradation was found by measurement of the FTIR spectra. FIG. 7 shows the FTIR spectra of the dye solution whereas FIG. 8 gives the FTIR spectra of the dye solution after photocatalytic degradation. The results in FIG. 8 exposed that the ring structures were certainly degraded which was confirmed by disappearance of peaks at the wavenumber between 540 cm-1 and 420 cm-1, which denote aromatic rings, after photocatalytic degradation. In meticulous, the connecting bond between anthraquinone rings was broken which was shown by disappearance of the peak ranging from 1335 to 1380 cm-1. Apart from the demolition of the aromatic structures, the functional groups attached to them were also transformed. 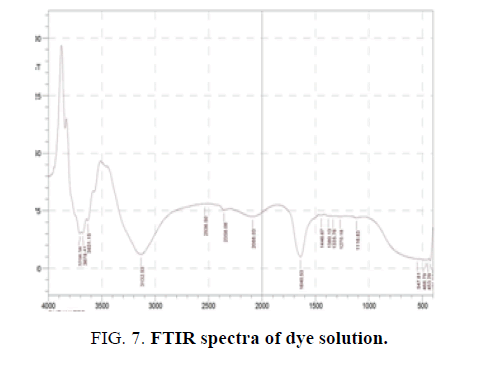 Figure 7: FTIR spectra of dye solution. Figure 8: FTIR spectra of UV irradiated dye solution with copper oxide nanocatalyst. In the present work the photocatalytic degradation of Vat Red 13 was carried out by UV irradiation using copper oxide nanocatalyst. By increasing the time of UV irradiation for a dosage of 4 mg copper oxide nanocatalyst, thedegradation efficiencyincreases and at a time of irradiation of 60 min, maximum degradation is observed. UV-Visiblespectral studies and FT-IR studies confirmed that the photocatalytic degradation process is an effectual method for the degradation of Vat Red 13. Galindo C, Jacques P, Kalt A. Photodegradation of the aminoazo benzene acid orange 52 by three advanced oxidation processes: UV/H2O2, UV/TiO2 and VIS/TiO2: Comparative mechanistic and kinetic investigations. Journal of Photochemistry and Photobiology A: Chemistry. 2000;130(1):35-47. Balcioglu IA. Treatment of textile industry wastewater by enhanced photocatalytic oxidation reaction. J Adv Oxid Tech. 1999;4(2):189-95. Suteu D, Zaharia C, Muresan A, et al. Using of industrial waste materials for textile wastewater treatment. Environ Eng Manag J. 2009;8(5):1097-102. Seddigi ZS. Removal of alizarin yellow dye from water using zinc doped WO3 catalyst. Contam Toxicol. 2010;84:564-7. Rauf MA, Ashraf SS. Radiation induced degradation of dyes-an overview. J Hazardous Mat. 2009;166(1):6-16. Arslan I, Balcioglu IA, Tuhkanen T, et al. H2O2/UV-C and Fe2+/H2O2/UV-C versus TiO2/UV-a treatment for reactive dye wastewater. J Env Eng. 2000;126(10):903-11. Chaudhuri SK, Sur B. Oxidative decolorization of reactive dye solution using fly ash as catalyst. Journal of Environmental Engineering. 2000;126(7):583-94. Stock NL, Peller J, Vinodgopal K, et al. Combinative sonolysis and photocatalysis for textile dye degradation. Env Sci Technol. 2000;34(9):1747-50. Liu H, Gong SP, Hu YX, et al. Properties and mechanism study of SnO2 nanocrystals for H2S thick-film sensors. Sensors and Actuators B: Chemical. 2009;140(1):190-5. Zhang Z, Yuan Y, Shi G, et al. Photoelectrocatalytic activity of highly ordered TiO2 nanotube arrays electrode for azo dye degradation. Env Sci Technol. 2007;41(17):6259-63. Bharathi S, Nataraj D, Mangalaraj D, et al. Highly mesoporous a-Fe2O3 nanostructures: preparation, characterization and improved photocatalytic performance towards Rhodamine B (RhB). J Phy D: Applied Phy. 2009;43(1):015501. Pouretedal HR, Norozi A, Keshavarz MH, et al. Nanoparticles of zinc sulfide doped with manganese, nickel and copper as nanophotocatalyst in the degradation of organic dyes. J Haz Mat. 2009;162(2-3):674-81. Sathish M, Viswanathan B, Viswanath RP. Alternate synthetic strategy for the preparation of CdS nanoparticles and its exploitation for water splitting. Int J Hyd Energy. 2006;31(7):891-8. Alonso E, Pérez-Rábago C, Licurgo J, et al. First experimental studies of solar redox reactions of copper oxides for thermochemical energy storage. Solar Energy. 2015;115:297-305. Hossain MI, Alharbi FH, Tabet N. Copper oxide as inorganic whole transport material for lead halide perovskite based solar cells. Solar Energy. 2015;120:370-80. Deka P, Deka RC, Bharali P. Porous CuO nanostructure as a reusable catalyst for oxidative degradation of organic water pollutants. New J Chem. 2016;40(1):348-57. Akhtar K, Haq IU, Malook K. Gas sensing properties of semiconducting copper oxide nanospheroids. Powder Technology. 2015;283:505-11. Nia PM, Meng WP, Lorestani F, et al. Electrodeposition of copper oxide/polypyrrole/reduced graphene oxide as a nonenzymatic glucose biosensor. Sensors and Actuators B: Chemical. 2015;209:100-8. Gao P, Liu D. Facile synthesis of copper oxide nanostructures and their application in non-enzymatic hydrogen peroxide sensing. Sensors and Actuators B: Chemical. 2015;208:346-54. Alizadeh T, Mirzagholipur S. Nafion-free non-enzymatic amperometric glucose sensor based on copper oxide nanoparticles-graphene nanocomposite. Sensors and Actuators B: Chem. 2014;198:438-47. Jeong C, Hyun MJ, Suh YW. Activity of coprecipitated CuO/ZnO catalysts in the decomposition of dimethylhexane-1, 6-dicarbamate. Catalysis Communications. 2015;70:34-9. Induja S, Raghavan PS. Catalytic efficiency of copper oxide in degradation of phenol using sintered calcium phosphate (SCaP) as catalyst support. Catalysis Communications. 2013;33:7-10. Ahmadi SJ, Sadjadi S, Hosseinpour M, et al. A heterogeneous strong basic nanocrystalline copper (II) oxide catalyst for efficient synthesis of 4-keto-4, 5, 6, 7-tetrahydrobenzofurans. Catalysis Communications. 2009;10(10):1423-6. Schön JH, Dorget M, Beuran FC, et al. Superconductivity in CaCuO2 as a result of field-effect doping. Nature. 2001;414(6862):434. Hemalatha S, Makeswari M. Green synthesis, characterization and antibacterial studies of CuO Nanoparticles from Eichhornia crassipes. Rasayan J Chem. 2017;10(3):838-43.